The PeeGee is the late blooming hydrangea that will grow into stunning trees about 8 ft. high. There is a fellow up the road from me who has planted rows of them along both sides of the road. He tends them with the greatest care, pruning in spring just so to get large blooms. Right now, they have turned from white to pink and they still look beautiful. In this painting, you can see the pinkish cast on the blooms while they are still white. 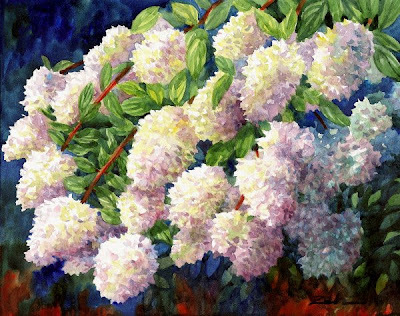 Hydrangea make such a lovely painting that I have painted them time and again.